A Tibetan man has died in prison after having been sentenced to 13 years for refusing to fly a Chinese flag during a government “loyalty campaign” in 2014. His family claims that he died from injuries inflicted by the Chinese authorities. In that occasion, around 1000 protesters were detained and two were sentenced to 10 years. 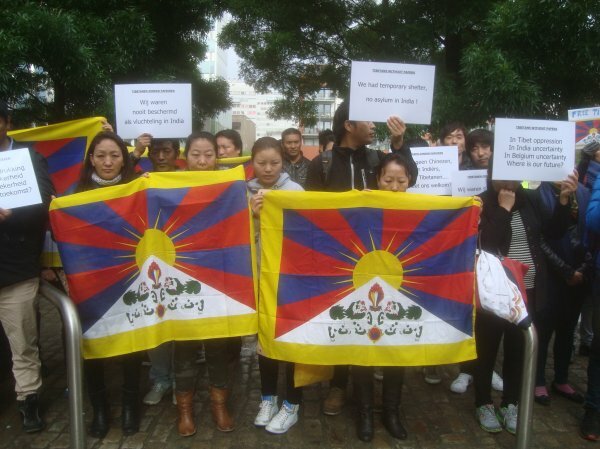 Demonstrations against the Chinese government are not rare in the Tibetan Driru county and, in 2013, four Tibetan villagers were killed and 50 were wounded while protesting against the loyalty campaign. A Tibetan man has died from injuries sustained under torture by Chinese authorities while serving a 13-year prison sentence for refusing to fly a Chinese flag, sources tell RFA [Radio Free Asia]’s Tibetan service. The body of the man known as Trigyal was recently turned over to family members, said Driru Samdrub, a Tibetan resident living in Europe with close contacts in the region. “He died due to severe torture under Chinese detention,” Samdrub said. Trigyal was one of three men from Mukhyim village in Tibet’s restive Driru (in Chinese, Biru) county who received stiff sentences for refusing to fly the Chinese national flag in 2014. County residents were being required to fly the flag from their houses in a government campaign to force them to show loyalty to Beijing. Some of the more than 1,000 residents protesting the order threw the flags in a nearby river. While Trigyal was given a 13-year sentence in 2014, the two other men, Ngangdrak and Rigsal, were handed 10-year terms, sources told RFA in earlier reports. Driru is one of three neighboring counties in the Tibet Autonomous Region’s Nagchu (Naqu) prefecture that Beijing considers “politically unstable.” Chinese authorities fear that political unrest there may spread unchecked to other parts of the region. About 1,000 Driru-area Tibetans were detained when authorities launched a crackdown in September 2014 designed to enforce the loyalty campaign, sources say. The campaign intensified in early October 2014 when villagers refused to fly Chinese national flags, throwing them instead into a river and prompting a deadly security crackdown in which Chinese police fired into unarmed crowds. Chinese security forces were accused of killing four Tibetan villagers and wounding 50 others in 2013 during Driru-area opposing the government campaign forcing displays of loyalty to the Chinese state. Bachen Gyalwa, the leader of Ushung village in Driru county’s Gyashoe Yangshok township was killed on Nov. 21, 2014 “on the orders of the local [ruling Chinese] Communist Party authorities,” the India-based Tibetan Centre for Human Rights and Democracy (TCHRD) said in a statement at the time.